The great white shark (Carcharodon carcharias) is a species of shark. They are world's largest living predatory fish. Mature sharks may grow up to 6.4 m (21 ft) in length and 3,324 kg (7,328 lb) in weight. There also have been a few reports of great white sharks measuring over 8 m (26 ft). This shark reaches its sexual maturity around 15 years of age. The lifespan of great white shark may be as long as 70 years or more. Great white sharks can accelerate to speeds over 56 km/h (35 mph). Great white sharks have about 300 teeth, arranged in many rows. The first two rows of the teeth are used for grabbing and cutting the animals they eat, while the other teeth in the last rows replace the front teeth when they are broken, worn down, or when they fall out. The teeth have the shape of a triangle with jags on the edges. Great white sharks eat fish and other animals, for example seals and sea lions. The great white shark has no natural predators other than the Orca. Some orcas have discovered they can paralyse the shark by flipping it upside-down. Then they hold the shark still with their mouth, and that suffocates it (sharks get oxygen by moving through the water). That aside, they are apex predators of marine mammals. The bestselling novel Jaws by Peter Benchley and the film by Steven Spielberg show the great white shark as a "ferocious human eater". In real life, humans are not the preferred food of the great white shark. However, of all shark species, the great white shark has the second largest number of fatal unprovoked attacks on humans. The great white shark is a shark. A shark is a type of cartilaginous fish. The back of the shark has a grey color and the underside is colored white. The sharks have three main fins: the dorsal (on back) and two pectoral fins (on the sides). There are five gill slits on great white sharks. Great white sharks have rows of teeth behind the main ones. When one of the main teeth break off, there are teeth always ready to replace it. It rolls back its eyes to avoid seeing blood while biting down on prey.The great white shark shakes its head side-to-side when it bites. This helps the teeth cut off large chunks of flesh. The great white becomes an adult about nine years after its birth. The growth of the great white shark is about 25-30 centimetres per year and they grow to an average size of 4.5 meters. The largest can be as much as 6.4 meters in length. Their liver can weigh up to about 24 percent of its own body weight. Great white sharks live in the sea. They live near the coast, in all warm waters. They occasionally make dives into the deep water of open oceans. They can be in water as shallow as three feet deep, and as deep as 1,280 metres. Eastern Pacific: from Alaska to California, and from Panama to Chile. Research has shown that the sharks of northern California are genetically different to other shark populations. DNA evidence shows the population separated from other great whites about 200,000 years ago (during the Pleistocene Era). By tagging the sharks they also learned that they are generally alone, but follow the same route through the ocean, and stay in the same places. From January to July they live near Hawaii, and then move to Californian waters between August and December. Sometimes, sharks attack human beings. When sharks see a new object, for example, a surfboard, they bite it to know what kind of object it might be. Sometimes, sharks see the shadow of surfers and attack them because they think they are seals. Some people think that humans are not good food for great white sharks, because the sharks' digestion might be too slow to cope with the human body's high ratio of bone to muscle and fat. It might be argued that because of this nearly all attacks by great whites do not continue after the first bite. Sharks are opportunistic predators. This means that they are not very picky on what they feed on. This behaviour has been observed when the animals completely consumed piecemeal bait. The explanation given is that the tactics generally involve biting prey once, so that the prey bleeds to death before the shark moves in to feed. Other large mammals, such as seals and dolphins also seem to have this tactic, as it minimizes the risk of the predator injuring itself. In most cases, humans tend to escape quickly after the first bite so that they are not consumed, simply bitten. Deaths in such cases are generally caused by loss of blood from the first wound. In cases where attacks have occurred and the victim has been unable to escape quickly, partial or whole consumption has occurred; lone divers are especially at risk of this. Most attacks also seem to occur in waters where it is hard to see or where the shark is confused, but this is unlikely given that the shark is in its natural hunting environment with highly developed senses. 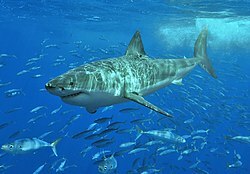 Wikimedia Commons has media related to Great White Shark. Wikispecies has information on: Great White Shark. ↑ Tricas, T.C. ; McCosker J.E. (1984). "Predatory behaviour of the white shark (Carcharodon carcharias), with notes on its biology". Proceedings of the California Academy of Sciences (California Academy of Sciences) 43 (14): 221–238. http://ia700704.us.archive.org/21/items/cbarchive_109514_predatorybehaviourofthewhitesh1982/predatorybehaviourofthewhitesh1982.pdf. ↑ Wroe, S. et al (2008). "Three-dimensional computer analysis of white shark jaw mechanics: how hard can a great white bite?". Journal of Zoology 276 (4): 336–342. doi:10.1111/j.1469-7998.2008.00494.x. ↑ "Great White Shark". National Geographic. Retrieved 24 July 2010. ↑ Viegas, Jennifer. "Largest great white shark don't outweigh whales, but they hold their own". Discovery Channel. Retrieved 19 January 2010. ↑ Taylor, Leighton R. (1993). Sharks of Hawaii: their biology and cultural significance. University of Hawaii Press. p. 65. ISBN 978-0-8248-1562-2. ↑ "Fox Shark Research Foundation - Great White Shark Facts". rodneyfox.com.au. 2013. Retrieved 24 August 2013. ↑ Hile, Jennifer (2004). "Great White Shark attacks: defanging the myths". Marine Biology. National Geographic. Archived from the original on 26 April 2009. Retrieved 2 May 2010. ↑ "Great White Sharks, Carcharodon carcharias at MarineBio.org". Marin Bio. Retrieved 20 August 2012. This page was last changed on 25 March 2019, at 03:42.